Your wedding is the most important day of your life. You want your entertainment handled by professionals. Relax and let Smithfield Entertainment provide you with professional and reliable entertainment tailored to your desires. From planning the flow of the reception right through the end of the day, you can count on us to make it perfect. We are more than a DJ company; we are an entertainment company. We offer several packages from low key to high energy. Party favors, lighting, fog, and bubbles are available as add-ons. Whether you select to have a formal or informal reception, traditional or contemporary, Smithfield Entertainment has the experience to make it just right. With our personal touch, our professional sound systems, and our large music collections, we will make your wedding reception the success it should be. We have a variety of wedding ceremony music, and we can offer the officiant a wireless hand-held microphone. Our DJ or MC (Master of Ceremonies) will coordinate all activities with the other members of the party professional team (i.e., caterer, photographer, videographer) to ensure that your reception flows smoothly and all of your memories are caught on film. We constantly "read the crowd" and adjust our music programming and guest interaction accordingly. We gladly accept appropriate requests from your guests both at the reception and in advance. Our MC will announce all of the special ceremonies (grand entrance, first dance, cake-cutting, father/daughter and mother/son dances, etc. ), that you choose to incorporate into your wedding reception. Our MC can also (at your option) lead your guests in participative dancing as well as interacting with your guests on the dance floor and in their seats. All of this is done without taking the spotlight away from the Bride and Groom. Our goal is to create and maintain a fun party atmosphere while recognizing that you are the true star of the event. 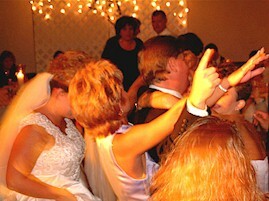 We can give you that personal one-on-one service you deserve, with the DJ or MC that will be at your wedding. It all starts with our Wedding Reception Planner. You start filling it out now with things like the names of the people in your wedding party and what your first dance song will be. Up to two months before the wedding, we'll hold a sit-down planning consultation with you where we will help you complete the reception planner. We will work with you to design your reception based on your ideas and personal preferences, and give you the style of music you wish to have played and the MC involvement you desire. You tell us what you do and don't want. We will assist you in choosing the perfect music arrangements, selecting the proper traditions or customs and planning the proper flow of events throughout your reception. From grand entrance right through to the very last dance, yours will be a party to remember. Smithfield Entertainment will be right there to make it perfect. The entire reception will reflect your own style and will be a most memorable occasion, enjoyable to all who attend. Check your date now, or contact us directly for questions & bookings.